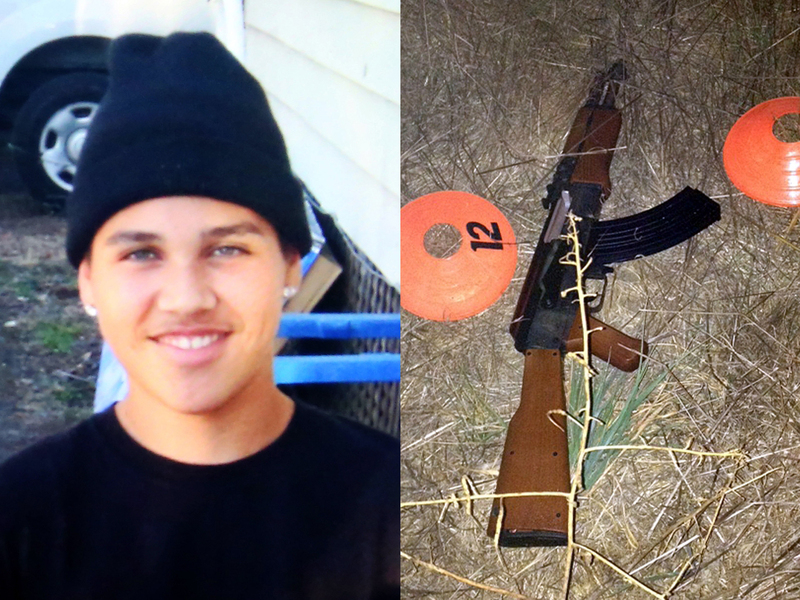 (CBS) SANTA ROSA, Calif. - The parents of Andy Lopez, a 13-year-old California boy who was shot dead by a police officer while walking down a street with a plastic replica of an AK-47, have filed a federal lawsuit in San Francisco gainst Sonoma County and Sonoma County Sheriff's Deputy Erick Gelhaus, reports CBS San Francisco. The lawsuit, filed Monday, claims that the department and Gelhaus, the officer who shot the teen seven times, deprived Lopez of his civil rights, and seeks unspecified damages. Since the incident two weeks ago in Santa Rosa, the family, along with friends and the Latino community have been galvanized and the streets have been full of protests, reports the station. The boy was walking down the street with the plastic gun-replica when deputies pulled over, and told him to drop it. The officer shot him when he turned to face them with what they thought was a real assault rifle, according to the station. Andy's parents have reportedly already filed wrongful death claims against Sonoma County. The federal suit reportedly claims Gelhaus violated the boy's Fourth Amendment rights, and that the county has an unconstitutional custom and practice regarding the use of deadly force. Attorney Arnoldo Casillas, who is representing Andy's parents Rodrigo Lopez and Sujay Cruz, joined them at a news conference in San Francisco Monday and said Gelhaus was "reckless" in the shooting. The lawsuit states that Gelhaus had a string of reckless incidents dating back to 1995, when he shot himself in the leg during a stop and search involving a teenager. Then a year later, he allegedly pointed his firearm at a woman who was holding her young son, reports the station. The lawsuit also mentions an incident earlier last month in which Gelhaus made a routine stop of a man named Jeffrey Westbrook and then unnecessarily pointed his pistol at Westbrook's head while he sat in his car, according to the station. Gelhaus "has problems controlling his firearms," Casillas said. The attorney said in the shooting of Andy, Gelhaus "was going to shoot first and ask questions later." Casillas said a witness who saw Andy just before the shooting said the plastic gun was clearly a toy based on "the way he was holding it, the way he was swinging it," as well as the fact that the 13-year-old did not seem to pose a threat at only 5 feet 4 inches tall and 140 pounds. Casillas said the family had a private autopsy done on Andy's body that called into question Gelhaus' version of events, in which he told investigators he fired after Andy raised the barrel of the rifle toward the deputies, reports the station. Casillas reportedly said the trajectory of the bullets that struck Andy show the boy did not point the gun at the deputies, and that Gelhaus continued firing even after the first bullet went through Andy's heart, causing him to fall to the ground. Andy suffered seven gunshot wounds, while at least one other shot missed and struck a nearby home, Casillas said. The deputy "basically unloaded in a super reckless way," he said. Rodrigo Lopez, the boy's father, spoke briefly about the case during Monday's news conference. "We want justice and also we want an honest investigation," he said. Casillas said an investigation by Santa Rosa police of the case was inadequate and had already exonerated the deputy, although the department has not officially released its findings, according to the station. Sonoma County Counsel Bruce Goldstein last week criticized the plans to file a civil rights lawsuit before the criminal investigation finished, saying the suit could interfere with the investigation. Casillas said that was the point. "We hope that by us doing our civil action now, they're moved to be more objective," he said. Goldstein was not immediately available Tuesday to comment on the lawsuit. Sonoma County Sheriff Steve Freitas has declined to comment on the claims by Casillas and referred questions to the county counsel's office.